The Tax Map is a graph of the United States Tax Code, represented as a network. 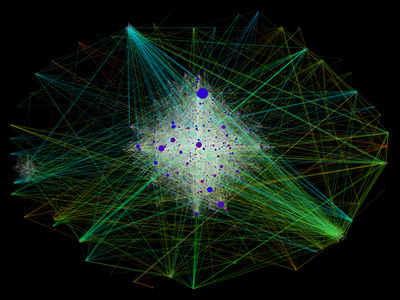 In the network each node represents a section of the tax code, while each edge represents a reference from one section to another. As the author explains, the project was born by a desire to better understand how the complexity of this mass of rules and exceptions would bear out if one were to "look at the mere structure of the tax code, stripped naked of its rules and semantics." 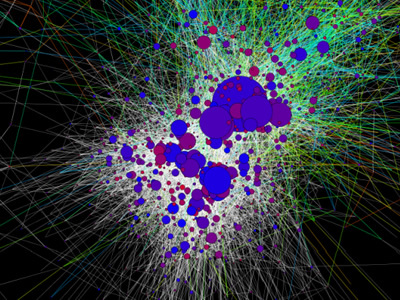 Each colored circle represents a section of the tax code. Size is determined by how many times that section of the tax code is referenced by other sections of the tax code; while color is determined by the ratio of references to a particular statute, by references made by the statute itself. This ratio is then calculated against a color range from blue to red to determine the final color. Finally, each line represents a reference from one statute to another. The color of the line is determined by whether the reference remains within a single chapter, or goes to a statute in another chapter. White lines are for intra-chapter, while colored ones are for inter-chapter. Each chapter is given its own color for outgoing references. The Tax Map was created by using the Perl and Java programming languages. Perl was used to scrape the online tax code for the relevant data. Java was used to render the images, using JUNG. I'd like to see this visualization applied to a body of documents that we assume is less complicated that US Tax Code. Otherwise, it's hard to see the siginificance of this visualization. Hey, I think I can see my refund!